Charleston, SC – Three roll-on roll-off vessels from American Roll-on Roll-off Carrier (ARC) Group’s U.S.-flag fleet – M/V Honor, M/V Freedom, and M/V Endurance – loaded over 414,000 square feet of military rolling stock and other cargo in Charleston, South Carolina in support of Operation Atlantic Resolve. The 1st Armored Brigade Combat Team (ABCT) of the 1st Cavalry Division is deploying from the United States to Europe. The loading operation was coordinated by the Army’s 842nd Transportation Battalion. ARC has the largest fleet of American-flag Ro-Ro vessels and the three vessels selected are among the most militarily-useful in the U.S.-flag international fleet. The 1st ABCT will set up operations in eight countries across central and Eastern Europe, as U.S. Army Europe (USAREUR) increases its presence across the region to help strengthen NATO’s defense and deterrence measures. Operation Atlantic Resolve has been ongoing since 2014. 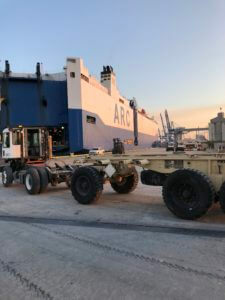 Cargo logistics are being coordinated by ARC with U.S. Transportation Command, Military Surface Deployment & Distribution Command (SDDC), and USAREUR’s 21st Theater Sustainment Command.